CHOKE GHODAR, PAKISTAN-AUG 27: Flood victims make their way along on a major flooded road as the water level goes down in the Punjab region allowing some to head home August 27, 2010 in Choke Ghodar, Pakistan. The country\'s agricultural heartland has been devastated as rice, corn and wheat crops have been destroyed by the floods, government officials claim as many as 20 million people have been effected by the flooding. 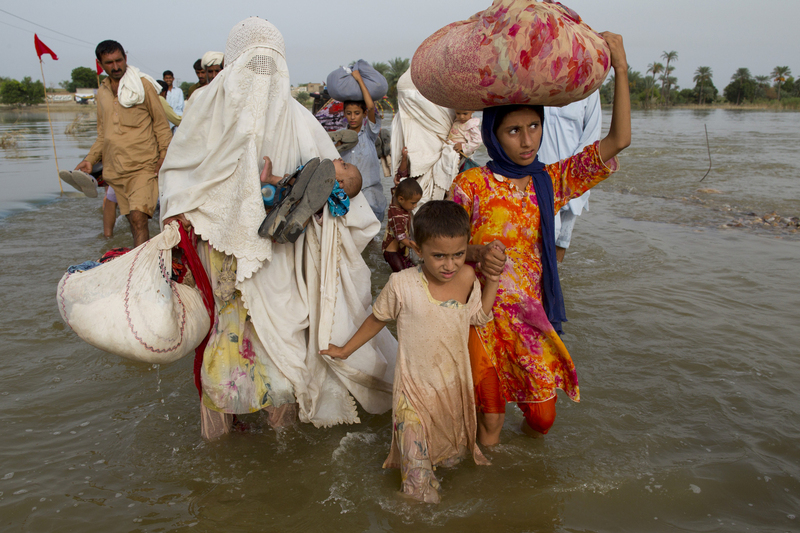 Pakistan is suffering from the worst flooding in 80 years as aid organizations and the government struggle four weeks on with the wide spread scale of the disaster which has killed over 1,600 people and injured 2,000. The relief effort had improved in Sindh province but is still being hampered by logistical problems, including the ability to reach many of the victims. The U.N has described the disaster as unprecedented with over a third of the country under water. It has now received more than half of the $460 million appeal it issued last week to pay for humanitarian operations over the next three months. The Taliban has hinted that it may launch attacks against foreign aid workers calling their presence \"unacceptable\".